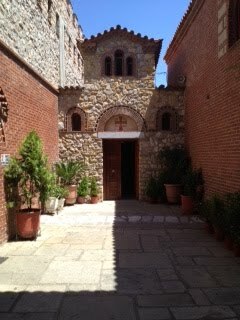 This morning I visited Daphni Monastery. The monastery was relatively simple to access from public transportation (don't rely on google...use it to get a general idea, then ask people...google told me to take the metro/bus the wrong way each time...good thing I didn't listen). 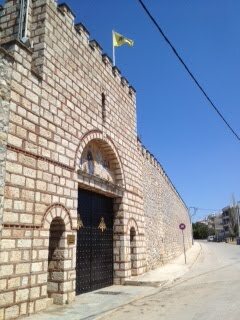 Daphni Monastery is well known as one of the greatest collections of mosaic icons and is a UNESCO world heritage site. 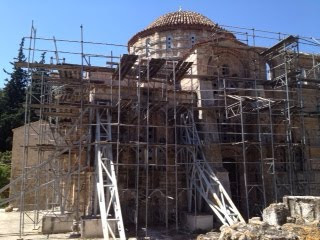 Unfortunately, the katholikon (main church) was severely damaged in an earthquake in 1999. All the books and half the websites said it has been closed for repairs. The official website listed hours for two days each week, one being Friday. I took a chance, and it was open. 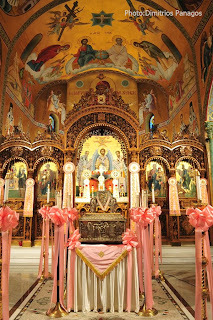 What I saw of the iconography was incrdedible. These are the icons in the textbooks...and it was incredible to see them in real life. Unfortunately, the whole experience was mostly disappointing. It hasn't served as a monastery for quite some time. I would suppose museum might be the right word, but even so, there wasn't much to see. The inside of the church is filled with scaffolding (no photography allowed...sorry). I couldn't see anything from the ground. I was escorted by a museum guard to ascend the scaffolding. At each level, a few icons could be seen from a distance, through metal beams and around plywood planks. I would ascend a level, see a few icons, then asencd some more. There was no "big picture" or context, just bits and pieces. 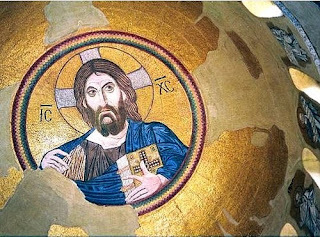 The "crown jewel" is the Christ Pantokrator in the dome. Unfortunately, it was inaccessbile and all I could see was a glimpse of his left hand. The guard hurried me along to watch the video in the next building "because [I] could see more in the video than in the church." After the video (just a slideshow of the icons), I returned to the church to see a few things in life that I realized from the video. Another guard stopped me, "You can only go through once. It wouldn't work if everyone got to go twice." I argued. Sometime after "I'm the only one here..." But before I got to "there are three of you and plenty of time for coffee and cigarettes..." the guard that escorted me stepped in and took me up to take a few more glimpses. A repeat? Probably not until the renovations are completed. There is more scaffolding on the inside, if you can believe it. I made a brief stop by the apartment to call Arvanitis to establish a time for a lesson. I quickly returned to the metro. The ticket is for 90 minutes for all modes of transportation. I didn't buy the monthly or weekly pass...I've just bought tickets as I need them because I can just walk almost everywhere, other than these extraordinary trips. I rode the metro to Kifissia, a suburb on the north-east side of Athens. Many people have told me it is the nicest part; I'd tend to agree with them. It is quite densely wooded (as in, comparable to an average Midwestern city). After riding the bus around for a while, I saw a couple of signs for the monastery. The driver dropped me off at the closest stop. I still had to walk about half a mile before I came to the 20-foot high stone castle walls. At the wall, I met a woman who was on the bus, but must've walked down a different street. She entered the monastery just behind me. 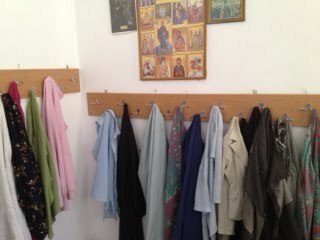 The first stop (still within the wall, and just inside the gate) was a room full of shirts, skirts, and scarves. A sign on the door instructed of the dress code. The lady from the bus put on long-sleeves over her strapless sundress. She handed me a long-sleeve shirt. I exited to a courtyard. 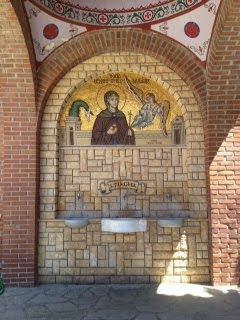 The first thing I noticed was a holy water fount. A little further was the church. A prominent sign warned (the only English text in the whole compound) that photography was prohibited. Just inside the church was a room with candles and holy oil. The candles were placed in a 3x8 foot bed of sand at table height, with a large powered hood above to vent the heat (almost all the churches in Greece have this feature, and I have yet to photograph it...a smart idea since the candles produce a lot of heat and most churches are not air-conditioned). Beside the candles, bottles were available for the holy water and holy oil. The oil was a large bowl with several lit wicks floating around. Beside the bowl, on the table, were several ladles. I filled several bottles. A nun walked past and, with a smile, handed me a bag to carry the bottles. 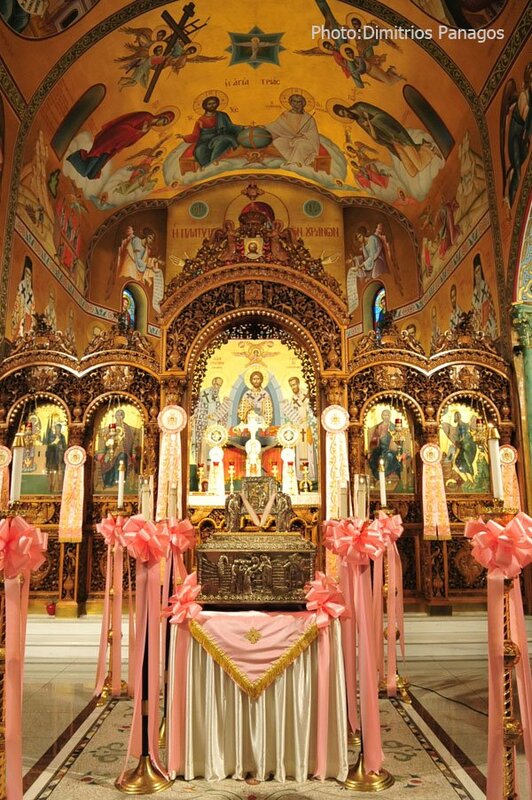 This was one difference from St. Ephraim's monastery, where I didn't see a single nun: there were women tending the candles and the store, sweeping the floor, etc., but not a single nun. 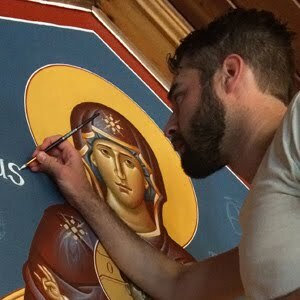 At St. Irene's, the nuns were doing everything. St. Irene was a noblewoman bethrothed to marry the crown prince of the Roman Empire in the 8th century. 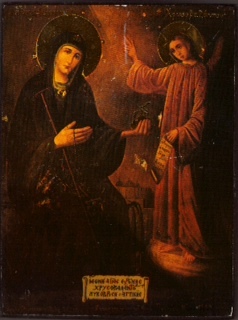 When she arrived at Constantinople, she gave her wealth to the poor and entered the Chrysovalanou Monastery. She lived a holy life, becoming a deacon and abbess of the moanstery. She was very strict in her prayers, ascesis, and fasting. She prayed from the afternoon until dawn every day, with her hands raised to heaven, not unlike Moses. She worked many miracles. A famous story goes that she told the nuns to welcome the sailor who would arrive that day. Sure enough, a sailor did arrive at her monastery. He had just sailed from Patmos. 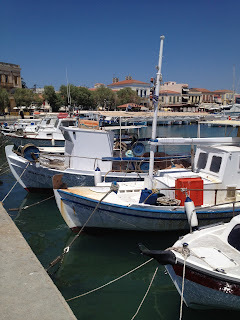 As he was sailing around Patmos, an old man called the boat to shore. He was unable, do to the rocks, so the man walked on the waves to the boat. 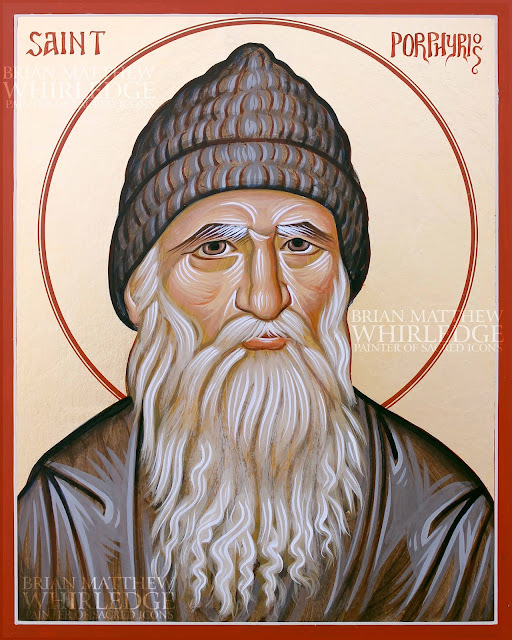 On the boat, he revealed that he was St. John the Theologian (the apostle and gospel-writer). He gave to sailor three apples to give to St. Irene. 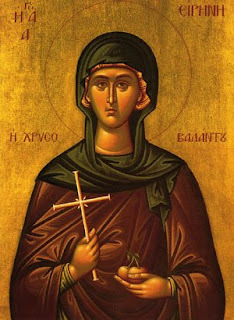 One apple was divided among the sisters, one solely sustained St. Irene for the duration of the 40 days great lent, and she ate the third shortly before her death. 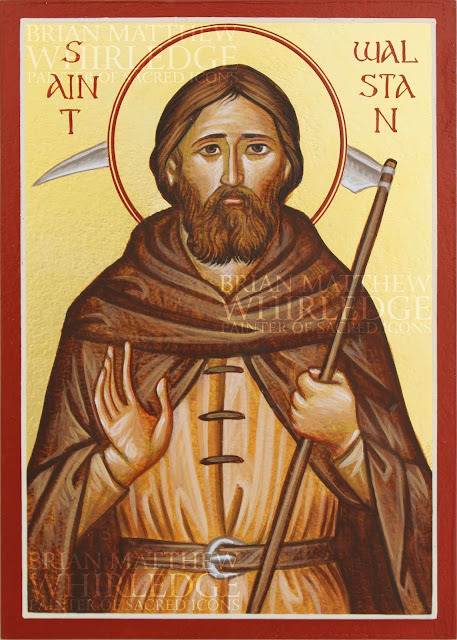 The nuns grow and bless apples to this day, and give slices of these apples to all the pilgrims. Many people have been healed by eating these apples after prayer and fasting. Her relics are not in the monastery and have sadly been lost to the ages. All that remains is her hand, which is in a monastery of the same name in Astoria, New York, which I may have the opportunity to venerate later this summer.